Spirit Lake is a small augmented lake in the High Uintas. It is one of the few lakes in the vicinity of the ridgeline that is accessible by road. Because of easy access, the area has heavy recreational pressure. A lodge and campground border the lake, and concessionaires offer horseback rides, etc. Spirit Lake is a natural cirque lake that was augmented by construction of an small earth-fill dam. The shoreline is owned by the Ashley National Forest, and public access is unrestricted. Reservoir water is used for irrigation, but the lake can only be drained six feet below original lake level. The dam raised water level five feet, and a trench to the dam allows the irrigation company to lower water level six feet below the original lake. The remaining water is never drained, functioning like a natural lake. The lake is 11' deep when it is drawn down to this level. 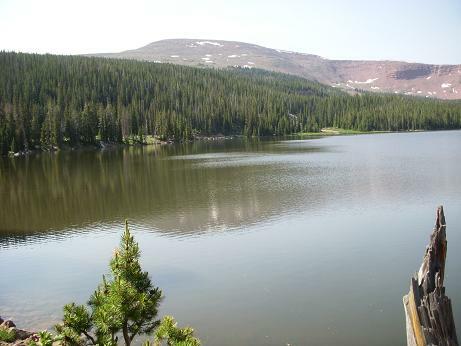 Spirit Lake is accessible from the Sheep Creek Road southwest of Manilla. Follow this road for about 11 miles to where Spirit Lake Road bends to the south. It is also possible to begin on U-150 in the Bear River area and take the North Slope Road to this intersection. The lake is about 8 miles south on this road. The route is well marked. Recreational facilities at the reservoir include Spirit Lake Campground, a USFS facility with toilet facilities, picnic areas, and 24 campsites. It has no drinking water. Upstream lakes include Jesson Lake, Columbia Lake, Summit Lake and Lily Pad Lake.